Britain's Prime Minister Theresa May and European Commission President Jean-Claude Juncker hold a news conference at the EC headquarters in Brussels, Dec. 8, 2017. There was relief in London and Brussels Friday after Britain clinched an initial agreement on its terms of divorce from the European Union, opening the way for the next — and even harder — phase of negotiations over the country's future trade relations with the economic bloc. Her aides say the deal was a triumph for her. But many of the red lines she had laid down previously were crossed to pull off the breakthrough, analysts say. To clinch the deal, May had to agree that the European Court of Justice will oversee the rights of EU citizens in Britain, for at least a minimum of eight years after Britain formally breaks from the EU, which is scheduled next year. She also agreed on an expensive exit bill, which will amount to $47-$53 billion. 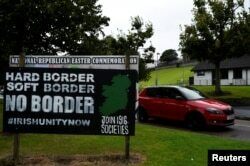 A car drives past a sign saying "No Border, Hard border, soft border, no border" in Londonderry, Northern Ireland, Aug. 16, 2017. And to the anger of Brexiters, May also agreed that Britain will maintain “regulatory alignment” with the EU to ensure there doesn’t have to be a “hard border” or regulatory barriers between Northern Ireland and the Republic of Ireland. That suggests to them that Britain is likely heading for a so-called “soft Brexit,” whereby it remains entangled with the EU. May and Jean-Claude Juncker, the European Commission president, had originally planned to agree on a first-phase deal on Monday, but it was thwarted in a chaotic breakdown between the British prime minister and Northern Ireland's Democratic Unionist Party (DUP), who May needs for her parliamentary majority. The DUP objected to some of the border commitments May was making. 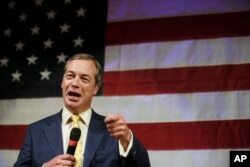 British politician Nigel Farage speaks at a rally for U.S. Senate hopeful Roy Moore, Sept. 25, 2017, in Fairhope, Alabama. For May, the challenge now may be to sell the terms of the divorce agreement to her own Conservative party. Brexiters within her cabinet, including Foreign Secretary Boris Johnson and Environment minister Michael Gove, who both challenged her for the party leadership last year, were supportive of May publicly Friday. “How long she will retain their backing? I wouldn’t like to place a wager on that,” remarked a Conservative lawmaker. The promise that Britain will maintain close regulatory alignment with many of the EU single market’s rules and regulations for the sake of Northern Ireland and the Republic of Ireland, even after leaving the economic bloc, quickly attracted criticism from other Brexiters Friday. They argue by entangling Britain with EU regulations, it will make it harder for Britain to strike out and to negotiate bilateral trade deals with other countries. They are suspicious also that, despite May’s insistence, Britain will leave the bloc’s customs union — which she is on course to keep Britain in — pushed to do so by ministers who want to retain a close relationship with the EU and opposition lawmakers in the House of Commons opposed to Brexit. “We need a much clearer understanding of what our negotiating strategy is,” he told Britain’s Sky News. For all sides in the Brexit divide roiling British politics there remains much to fight over, including the biggest of all questions: What should Britain’s future relationship with the EU look like? The first-phase deal is full of ambiguity and fudge and leaves more questions unresolved than it answers, analysts say.